This was the reaction I got from friends every time I explained Sony’s new DEV-50 Digital Recording Binoculars. And it’s an accurate description. 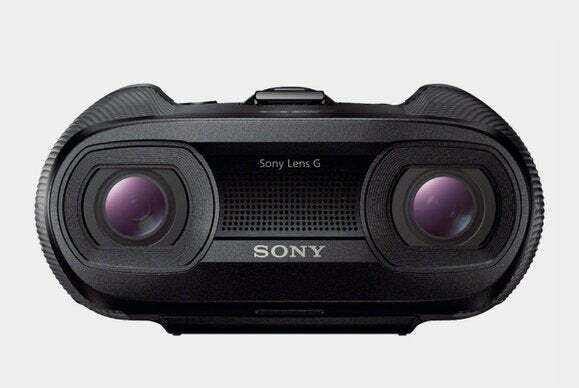 Sony has reconceived a familiar recreational accessory by taking a passive optical instrument and turning it into an active digital video device. The DEV-50 even sort of resembles the boxy, button-studded gizmo that helped Luke to scan the horizon for his AWOL R2 unit. Remaking something simple as a digital gadget is an obvious motive for creating a new product, if sometimes a risky one. Who wouldn’t love to have a functional version of that Star Wars prop? Something that doesn’t simply magnify what you see, but enhances the viewing experience? Sony's new $2000 DEV-50 digital binoculars are about the same size as conventional 12X binoculars, except that they're packed with electronics instead of lenses. While gutting something old that works to turn it into something new and digital isn’t automatically a win, and the DEV-50 stumbles in a side-by-side, feature-for-feature comparison with conventional binoculars, you’re still left with an attractive, easy-to-use product. The DEV-50 combines many of the convenience and capture features of a digital camera. All controls are within reach of your index fingers, including a five-input joystick to navigate its internal menus. Instead of a pair of metal tubes packed with lenses, the DEV-50 offers a pair of 1080p HD camcorders joined together. Two sets of power zoom lenses (with up to 12X magnification) focus light onto two image sensors, which then drive two 1024-by-768 OLED digital viewfinders. Buttons to control the zoom and other features fall naturally underneath your fingers. Although they function like conventional binoculars (hold them up to your face and get a close-up view of something far away in stereo vision), the similarity quickly ends. The power zoom lets you rapidly find and lock in on the object of your interest, without any of the desperate sweeping that fixed-magnification binoculars demand. Once you’ve found the bird that had caught your attention, optical image stabilization keeps the frame relatively steady as you observe, and a fast automatic focus feature means you won’t have to continue to hunt for sharp edges as your subject moves. The DEV-50 also surpasses conventional binoculars in low light, thanks to a special high-gain viewing mode. The high-gain mode isn’t true night vision, but it’s good enough that you won’t need to give up and call it a day when the sun slips under the horizon; the increase in digital noise, while noticeable, is acceptable. It stands to reason that if you’re looking at something through binoculars, that thing is probably interesting enough that you’d want a record of it. And so we arrive at the DEV-50’s most tantalizing feature: image capture. A button under your left index finger starts and stops the recording of full 1080p HD video. A button under your right hand snaps a 20-megapixel photo. And the DEV-50 can automatically geotag all your images, thanks to its built-in GPS receiver. But aha! There are two lenses and two image sensors! Yes, you can shoot HD video in true, stereoscopic 3D! Wow! But all this comes at a high price: The DEV-50 is $2000. Sony is taking preorders now for an estimated ship date of June 21. The DEV-50’s feature set far exceeds that of conventional optical binoculars, no doubt. However, at the core binocular task of letting you examine something far away as though you were up close, this super-high-tech digital version isn’t as good as the conventional kind. Although its electronic viewfinder is beautifully sharp and the pixels aren’t noticeable while you’re observing, a conventional binocular’s 100 percent optical light path always yields crisper images than digital binoculars’ pipeline of lens to image sensor to electronic viewfinder (EVF). Even a $600 set of conventional binoculars allows you to observe a wider range of colors, tones, and shadow details. The question then becomes, are the DEV-50’s unique digital features good enough to overcome its shortcomings? To answer this, I spent a couple of weeks trying them out under a range of typical scenarios, and focused on three major tests. I can tell a first-generation MacBook Air from a third-generation one at a split-second glance, but the only birds I can name have either been featured on U.S. currency or in animated movies. So I went on a walk through a nature preserve with a naturalist and wildlife author who’s been birding for 30 years. We spent about an hour swapping between the DEV-50 and his midrange-price 10X binoculars. The DEV-50 comes with large rubber eyepieces that block out all ambient light—and your entire peripheral vision—which offers a bright digital view. But to save power, the electronic viewfinders remain dark until a little light sensor next to the eyepiece detects that you’re holding the binoculars up to your face. When a fraction of a second counts, the Dev-50's blackout interval is problematic. The delay didn’t bother me, but to my experienced birder companion, the half-second blackout before observation was disorienting and annoying. It was an interruption in his mental bird-spotting workflow; worse, he thought it would interfere with trying to identify those little birds that flit around, when every split-second counts. So the DEV-50 presents a problem for one of the three things birders use their binoculars for: I’ve spotted a bird, and now I want to identify it; I want to follow a bird across the sky; and, I want to scan this swampy area and see what’s visible. After using his optical binoculars for a little while, I could see what he meant. The DEV-50 was more than adequate for taking in the broader and finer details of the birds, even at its maximum 12X magnification. But his conventional binocs were far superior at communicating subtleties, particularly for those birds that rudely chose to bob along in the shadowy bits of the ground. He did like the DEV-50’s zoom and optical image stabilization features, and noted that the autofocus didn’t seem to have any problems tracking a bird in flight. This was an area where I—as an inexperienced user—vastly preferred the Sony to his conventional binoculars. The DEV-50's image stabilization and auto-focus features helped track birds in flight. “Eastern Towhee,” he said, confidently pointing to a small bird on a distant branch that looked kind of like a robin but definitely wasn’t. I was wearing his optical binoculars and ran into the same problem I always struggle with: I could see the bird clearly with my eyes, yet found it almost impossible to orient myself and find that same bird—or even that same branch—when I was looking through the 10X optical binoculars. But it was a snap with the DEV-50. Raise them to my face, zoom wide, steer in the general vicinity, and then zoom right on in until I have it. And my hands didn’t need to remain terribly steady, either, thanks to the stabilization. In the end, he pronounced the DEV-50 as attractive for recreational use but inferior for serious bird-watching and identification. The DEV-50 really shone at the ballpark. There are always three or four dramas being played out on the field as the pitcher stands on the mound with his foot on the rubber. Whether I wanted to try to spot what kind of pitch he was preparing by zooming in on his hands, or was paying attention to the tension of the batter, or trying to appreciate the reflexes of the overly antsy runner on first, or just drink in the patient boredom of the players in the visitors’ dugout, the DEV-50 elevated my engagement with the ballgame. Viewing baseball in 3D mode is a unique way to experience a live game. A menu option lets you view the action either in 2D or 3D. I kept the binoculars in 3D mode throughout most of the game—a unique way to experience baseball. The DEV-50 walks you through a viewfinder setup when you take it out of the box. You click buttons and turn wheels and adjust diopters so that Line A now intersects with Line B without ghosting, and everything’s sharp and clear. Once you’ve finished the setup, the 3D is completely effective and yet not completely natural. The wholly digital presentation, coupled with the eyecups’ total removal of your peripheral vision, makes it feel as though you’re there at the ballpark but watching the game exclusively on 3D HDTV. But that’s not a bad thing. The autofocus and image-stabilization work well, and operating the zoom control becomes second nature. Yes, it’s like watching the game on television...but it’s as though you own the sports network and the director always shoots the game exactly the way you want to see it. I’ve watched ballgames through conventional binoculars before, and I vastly prefer the DEV-50. My eyes were also quite comfortable even after using the DEV-50 throughout my 3 hours at the ballpark. This, despite warnings about taking the binoculars away from the eyes if I began to experience dizziness or nausea. The effect was a bit off-putting when the device was fresh from its box, but it helped to get the DEV-50 dialed in just right. The preproduction kit Sony sent me also included a padded case. I didn’t use the case even once during two weeks of daily use, and by the time I boxed the kit up and sent it back, the DEV-50 still looked good and worked well. Sony emphasized that the DEV-50 is being sold as digital binoculars and not as a camera. Fair enough. That said, when the DEV-50 was first described, it was the camera features that got my whiskers twitching. The zoom range on these optics is eye-popping: in 35mm terms, the camera goes from 50 to 2000 millimeters. Those tech specs filled my head with fantasies of shooting poster-quality 20-megapixel photos of duck eyelids from way across the other side of the pond. After my first round of tests, I had to concede that the laws of optics are fairly immutable, and the DEV-50 shouldn’t be faulted for failing to live up to my completely unreasonable expectations. The DEV-50 has a hella-broad zoom range, from a conventional 50mm wide to an insane 2000mm ultra-telephoto. But at that top zoom setting, digital zoom plus interpolated 20-megapixal image resolution causes the image to suffer. A super-super-telephoto lens creates the same challenges for every camera. At the top end of the zoom range, handheld camera shake becomes a problem—despite the DEV-50’s image stabilization—and because the lens has only narrow apertures available at that zoom length, good lighting is a must, and bright, direct sunlight is highly desirable. Another caveat has nothing to do with physics. The DEV-50’s still camera writes 20-megapixel JPEGs. But most of these megapixels are interpolated: The sensors themselves output only 5.42 megapixels of data. Also, at the most extreme end of the zoom range, the zoom transitions from optical magnification to digital. An unedited photo shot with the DEV-50 at maximum zoom. It shows the image degradation when the camera transitions to digital zoom. The digital zoom doesn’t really call attention to itself when you’re using the DEV-50 as binoculars. But it can take some mighty awful photos if you shoot at maximum zoom. 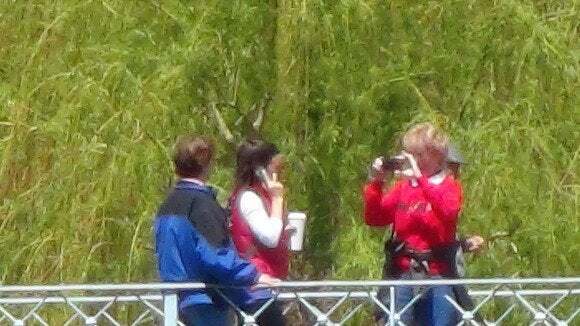 Such extreme zoom shots are clear enough to see two tourists 500 feet away, but not nearly clear enough to even guess whether one is taking the other’s photo with a camera or an iPhone. That said, the DEV-50 can take some lovely photos, if you stay away from the deep end of the zoom range. Of particular note: it can focus on close objects even at high magnification. I had no trouble shooting crisp portraits of the squirrels feeding just 4 or 5 feet away from me in the park. Here's a squirrel portrait taken with the DEV-50. Here's another shot of the same critter, taken with a Panasonic GX1 16-megapixel camera and the equivalent of a 90-400mm zoom. Sony doesn't promote the DEV-50 as a camera, but under the right conditions it can easily be mistaken for one.